Jackie Degregorio is a Senior at UConn. She is studying natural resources-conservation and sustainability while pursuing a minor in sustainable community food systems. This past summer she worked at a nursery, completed a permaculture design course and hiked in Wyoming and Montana. She is currently working on an edible forest garden project at the UConn student farm. She is interested in perusing farming with a focus on permaculture and hopes to continue her involvement in community food systems. In addition to farming, some of her hobbies and interests include pottery, mycology, natural medicine, backpacking and cooking. Jacqueline was awarded a $4,000 Scholarship from FGCCT and the National Hazel Knapp Scholarship in the same amount. 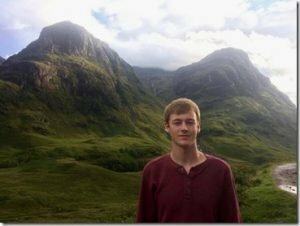 Andrew Christensen is studying ecological agriculture at the University of Vermont. In past summers he worked with his dad focusing on plant care, garden installation and maintenance. Most recently he worked for Upper Valley Landscape on commercial and large-scale horticulture projects that incorporated stone work and hardscapes. Andrew hopes to help farms become more efficient by introducing sustainable techniques and rethinking how plants are grown/setup from both a permaculture point of view and the plant’s actual physiology. Outside of school he likes to ski, hike, fish and take care his garden in Burlington. Andrew was awarded a $2,000 FGCCT scholarship but was unable to attend the Awards Meeting. 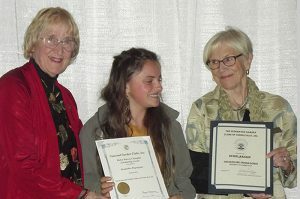 The Federated Garden Clubs of Connecticut has a proud tradition of awarding scholarships to college and university students whose area of study falls within the scope of our mission, such as botany, environmental studies or landscape design. The program was begun in 1982. Amounts awarded are based on the qualifications of the applicant and the funds available. 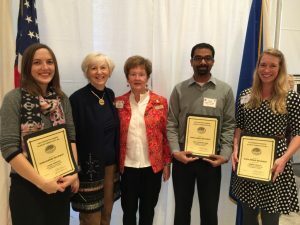 Scholarships are funded by the generous donations of our Connecticut member clubs and other individuals and organizations. 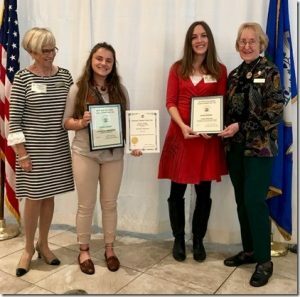 The Federated Garden Clubs, Inc. awards scholarships to students entering their junior or senior year or who are graduate students in any certified college or university. It does not have to be a school in the state of Connecticut. Students must be legal residents of Connecticut (have a Connecticut Drivers License and/or be registered to vote here) and be majoring in one of the following fields: Agronomy, Botany, City Planning, Conservation, Environmental Studies, Floriculture, Forestry, Horticulture, Land Management, Landscape Design, Plant Pathology, or allied subject. They must have a grade point average of at least 3.0 and demonstrate financial need. PhD candidates are not eligible. The deadline for applying for a scholarship is always July first each year. Contact Scholarships@ctgardenclubs.org with any questions.